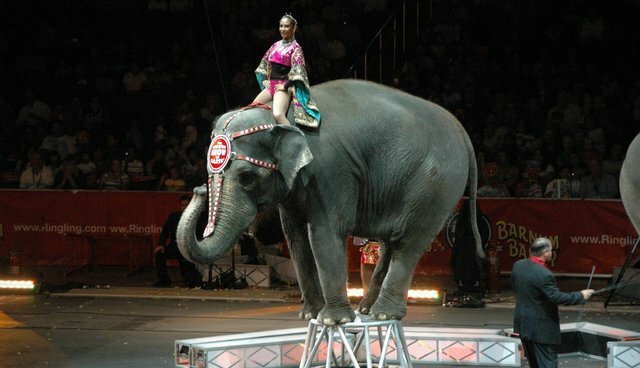 Ringing Bros. announced its groundbreaking decision to end its use of circus elephants in March. But unfortunately its parent company Feld Entertainment - which will still own the retired elephants - is sticking to its same absurd views about animals in captivity. On Friday, Stephen Payne, vice president of communications for Feld Entertainment, penned a truly ludicrous op-ed for the Cincinnati Enquirer arguing that animals are better off in captivity than in the wild. Here's everything that's (very, very) wrong with Feld Entertainment's position. Payne: "It's unfortunate when children are used to advance an extreme animal rights agenda, the full details of which they could never be fully able to judge its merits." Here's the article Payne's referring to. He recently spoke at an elementary school about how great circus elephants have it. The students had seen photos of animals performing and decided they didn't believe him, and wrote adorable letters to circuses and SeaWorld about how animals should be treated better. Apparently, believing that exotic animals belong in the wild is an "extreme animal rights agenda." Payne: "Whether by poaching, habitat destruction or encroachment by people, many animals are forced to live in the 'wild' at their peril." According to Payne, elephants are forced to live in the wild and are better off in captivity where they can be protected from nature. Yes, there's poaching in the wild. But there's also grass, sun, room to walk and run, families to build and freedom. Elephants should be protected from poaching - but chaining them up in captivity isn't the way to do that. Payne implies that elephants live longer, better lives in captivity. But while Ringling Bros. proudly boasts its elephants live an average of 45 years - outside estimates place that number at only 39 years - elephants can live up to 70 years in the wild. And common sense says that, if protected from outside threats and provided with excellent medical care, these animals should be reaching the end of their natural lifespan. Payne: "[Our elephants] will never be in danger from poachers and always receive the best veterinary care, a lot of exercise, clean water, plenty of food and room to socialize with their herd." 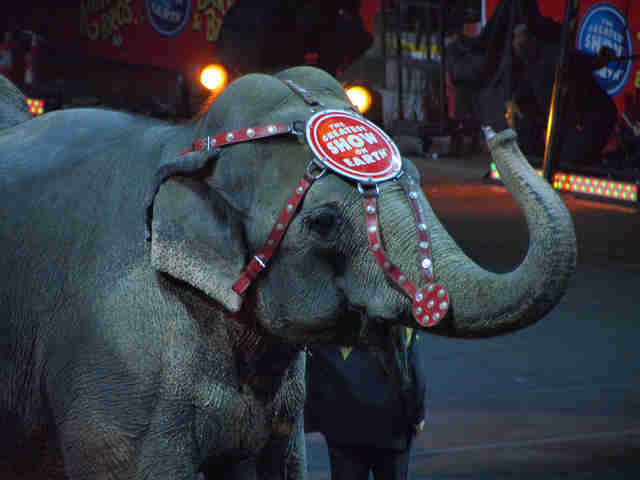 As recently as December, a USDA report showed that Ringling Bros. had left three elephants in boxcars for up to four days, during which they didn't receive necessary veterinary treatment for existing ailments. Ringling Bros.' elephants are also plagued by health issues that are rare in the wild, including chronic foot problems, arthritis and tuberculosis. In the wild, elephants walk at least several miles per day, and up to 50 miles if they're looking for food. As seen above, Ringling Bros.' elephants rarely get exercise, and sometimes go entire days without getting the chance to stretch their legs. Elephants are highly emotional and social creatures, and, in the wild, will live in matriarchal herds. Females will stay with their mothers for their entire lives, while males will stay with their mothers until around age 12. 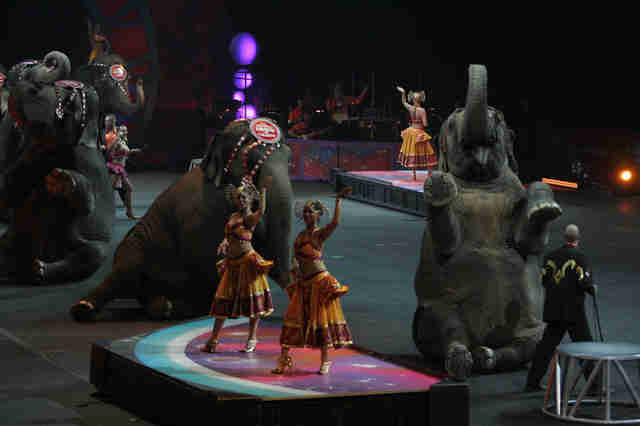 Ringling Bros. rips babies away from their mothers at just two years old. 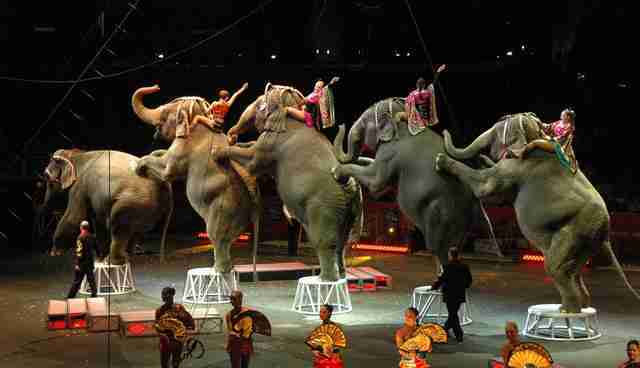 Payne: "Everything seen in a Ringling Bros. performance is based on the animals' natural behaviors. Elephants do stand on their heads and hind legs, unprompted." Yes, elephants will sometimes stand on their hind legs to reach branches in the wild. But it's absurd to claim that dressing up an elephant in feathered showgirl hats, carting them across the country in cramped, overheated boxcars, chaining them up when they're not performing and beating them with bullhooks is natural. Nor is making them stand on their heads repeatedly or climb onto tiny stools to perform. That's precisely why Ringling Bros. refuses to perform in cities that ban bullhooks - because they know the elephants won't perform if they don't force them. Payne: "Ringling Bros. is inspected by local, state and federal animal welfare officials in almost every city we visit...We are licensed and routinely visited by federal animal welfare officials from the U.S. Department of Agriculture." On one hand, the USDA has a frighteningly long history of ignoring violations by Ringling Bros. On the other hand, when they finally investigated in 2011, Ringling Bros. had to pay the largest fine ever levied against a circus for at least 27 different different violations of the Animal Welfare Act. Neither fact is comforting. Payne: "Yes, we did pay a settlement to USDA, but we did not agree with most of what they said we did wrong." In other words - trust the USDA to regulate us and make sure we're up to standards. But if they tell us something is wrong and we're hurting our elephants, we'll refuse to listen.